What…..a Free Coffee Machine !?! 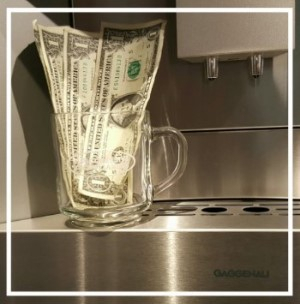 Okay…….you have to stretch the math to call it a free coffee machine, but if you go to “FourBucks” once a day for about a year and a half, you will spend as much money as it costs to get our best deal on a built-in coffee machine. 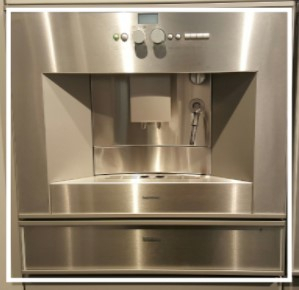 In recent years, coffee systems were introduced by Wolf and Jenn-Air, while Miele’s coffee machines got even more advanced. The BSH Corp. (Bosch, Thermador & Gaggenau) coffee machines seemed old fashioned by comparison. On the sureface,the new all electronic coffee machines appear to significantly outclass the older BSH units, but the reality was that we loved the simplicity and reliability of the classic machines. You change cup size or strength with knobs, so you never had to work through any computer menus. Frothing milk was a little bit more manual than the fancy carafe based systems, but the milk was always outside the machine on a dishwasher asafe wand and there was no required milk cleaning function with specific chemicals to purchase. The price was a little better, too. Well, new Bosch and Thermador coffee systems are here now and they are suitably awesome. We will have the new Gaggenau machine soon. To make room for the new products, BSH Corp. made us a deal on some of the remaining Gaggenau coffee machines. The Gaggenau CM210710 sold for $2949 until just a few weeks ago, but we have several in inventory for $1999. In a market where the competitive brands cost as much as $3699, that is a fantastic value. 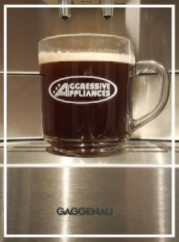 If you are interested in a built-in coffee machine that makes coffee as good an any machine available today, is easier to learn and maintain than any other machine, and costs less….come see us soon. When these are gone, you will have to buy one of the more complex and expensive machines: yes, it will have cooler features, but it won’t make better coffee. You will love any of our available coffee systems, but why spend more and stretch your learning curve. By the way, do not forget to make room in the cabinets for Gaggenau’s matching cup warmer. There are few things in life worse than putting hot coffee in a cold cup. *** Please refer to our Clearance List on our website, it stays updated with savings you don’t want to miss !